The PMA-50 Stereo Amplifi er has been created for serious Hi-Fi listeners looking for a compact and high quality design. At the same time, it features next generation music playback options by o ering a unique range of digital inputs, including optical, coaxial, USB-B, and even wireless Bluetooth connectivity. 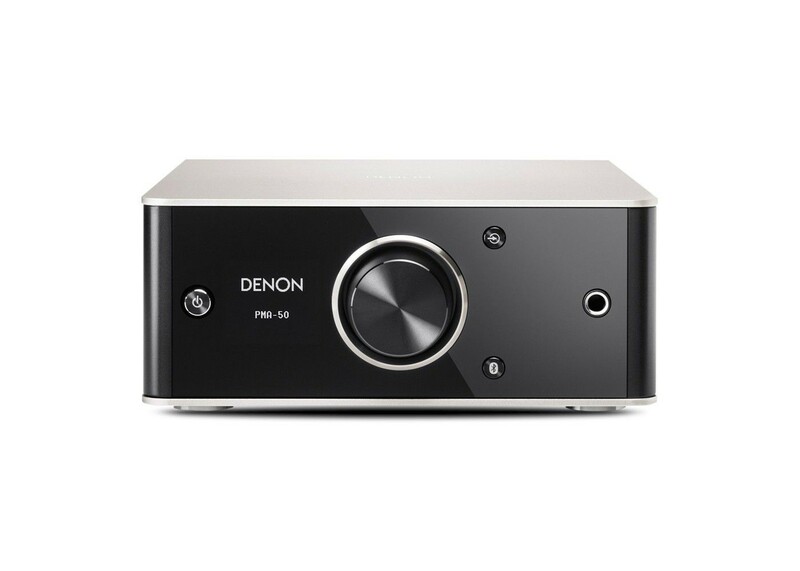 It delivers Denon high quality sound thanks to the integrated Advanced AL32 Processing. It emits high resolution audio up to 192kHz/24bit, comes with DSD 2.8MHz and 5.6MHz capability and thus delivers a new level of sound quality from any source. For the ultimate fi delity with 16-bit, 20-bit and 24-bit digital audio tracks, the PMA-50 features Denon’s Advanced AL32 digital audio processing system. Featured on Denon’s premium audiophile disc players and digital audio components, Advanced AL32 processing upconverts, digitally fi lters and noise-shapes lower bit data to full 32-bits, delivering remarkable dynamic range and noticeably better low level resolution. Your favorite digital audio tracks have never sounded better. The amplifi er section incorporates DDFA technology from CSR. The output stage circuit has a discrete construction which realizes higher Signal-to-Noise-ratio and lower distortion compared to conventional class D amplifiers. This advanced amplifier system delivers superior audio fi delity along with high amplifier e ciency at 50W into 4 ohms. The premium grade multi-way speaker connectors let you connect speaker cables via bare wire, pin connectors as well as banana plug connectors. Via the USB-B input, you can connect your Mac or PC to the PMA-50 and enjoy high resolution audio tracks. The PMA-50 can play high resolution PCM fi les up to 24-bits/192-kHz along with high resolution DSD 2.8 MHz and 5.6 MHz fi les (DSD is the advanced digital audio coding system of SACD). A USB-A to USBB cable is included. To eliminate induced digital noise via the USB input, the PMA-50 features a dedicated noise isolation block prior to the digital amplifi er and D/A conversion block that prevents digital noise from degrading the audio fi delity. In addition to the USB-B input, the PMA-50 features 2 optical digital audio inputs and 1 coaxial digital audio input. There’s also a stereo analog input for connection to legacy analog sources. Stream your favorite audio tracks from your portable devices via the PMA-50’s Bluetooth connectivity, which features quick and easy pairing via the Bluetooth button on the front panel. Simply activate the Bluetooth function on your device, press the Bluetooth button on the front panel or the remote control and when prompted, enter the supplied 4 digit passcode on your device. Your device and the PMA-50 are instantly paired and up to 8 devices can be remembered. For even faster pairing, the PMA-50 features NFC (Near Field Communication). Simply activate your NFC-enabled Bluetooth device and place it next to the N mark on the PMA-50 (located on the side panel), and it’s instantly paired with no need for manual passcode entry. Plus, the PMA-50 features Multi-point Bluetooth connectivity which allows 3 Bluetooth-enabled devices to be connected simultaneously. Play tracks from 1 device and when it’s paused or stopped and another paired device’s play function is activated the PMA-50 automatically switches to that device. The front panel display shows the name of the currently selected Bluetooth device. The stylish and elegant compact chassis features deluxe fi nishes including soft aluminum matte with bright silver tone accents and glossy and matte black surfaces. For optimum placement versatility the PMA-50 can be positioned either horizontally or vertically and it features removable feet and screw caps that are quickly and easily re-confi gured. The OLED display shows the source selected via graphical icons and text as well as the sampling frequency and data format of digital sources. The PMA-50 features an automatic display orientation function that detects if the amplifi er is mounted vertically or horizontally and adjusts the display accordingly. For top audio fi delity the PMA-50 is equipped with a dedicated headphone amplifi er circuit that features a high speed ultra low distortion wideband op amp that’s paired with a fully discrete fi nal output stage. In order to accommodate the widest range of headphone types, the PMA-50 features an adjustable headphone impedance control, with 3 settings for low, medium and high impedance headphones which provide proper matching of headphone impedance and amplifi er gain. The headphone jack features a 3.5mm connector for compatibility with premium home and professional studio headphone models.